Starting from the 5th generation of iPod Classic, Apple had added the support for video playback for it. Although the screen of the iPod Classic was not big, it does make watching video on it an interesting experience. And not to mention it could be a great source of entertainment to kill time. If it’s your only source of entertainment or a backup choice for that, consider putting your DVD movies on it. It’ll serve you well as a video player when you need something to kill time and your phone’s battery is dying. Check out how you can convert DVD to iPod Classic with a DVD to iPod Classic Converter. The video formats supported by the iPod Classic are MP4 and H.264. So as long as you can find a way to convert DVD to these two formats, you’d be able to watch the DVD movie on iPod Classic. MP4 and H.264 are both formats that can be commonly seen on PCs and mobile devices. So it’s not hard to find a suitable DVD ripper to convert your DVD collection to the said formats. But the quality is what matters. As you know, DVDs are in a much lower resolution than Blu-rays or even streaming contents these days. If the DVD Ripper can’t produce a high quality output MP4 video, then the movie would be blurry and basically unwatchable. My first choice of DVD to iPod Classic converter to convert DVD to iPod Classic would be Leawo DVD Ripper. 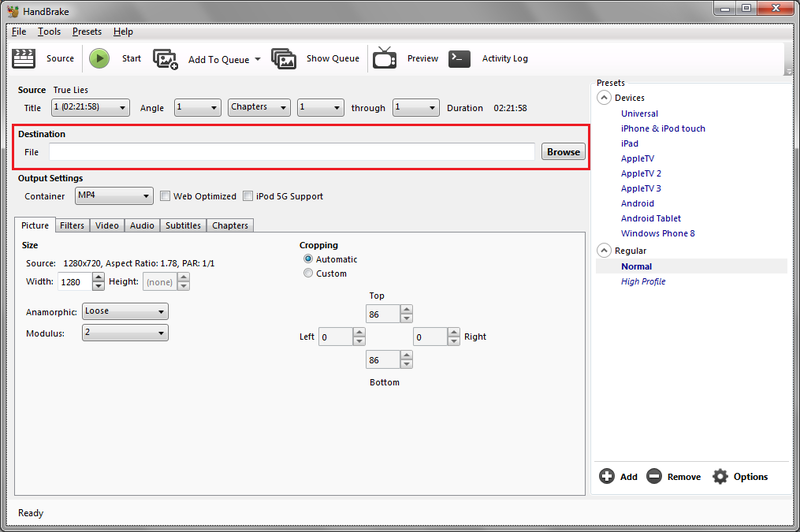 It can easily have your DVD collection converted to MP4 or H.264 or if you need, even lossless MKV video. The built-in video editor of Leawo DVD Ripper is able to trim, crop a DVD movie, add watermarks on it, adjust the brightness, saturation and contrast of the video, or even add 3D effects on the movie. Other than some popular video formats, you can even go for audio formats like MP4, WAV, FLAC to have the DVD movie converted into an audio file when needed. An MP4 video can be coded using different video codecs and a wrong codec might cause the iPod Classic to fail in playing the video. To prevent such thing from happening, you can directly choose the profile provided by Leawo DVD Ripper that are made and customized specifically for iPod Classic. 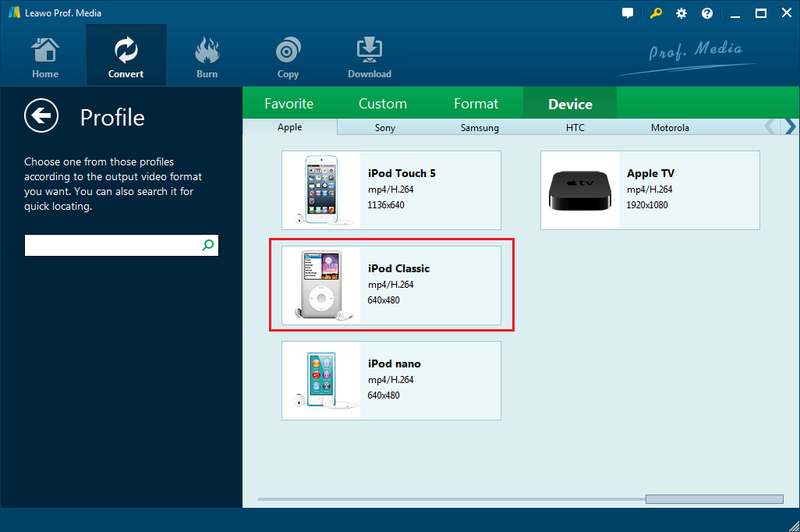 The program has got a lot of dedicated profiles for different devices and iPod Classic is one of those devices. With the iPod Classic profile, you are able to convert the DVD movie into a video that’s most suitable for playing on the iPod Classic. Here’s something about Leawo DVD Ripper that you should note. The program isn’t an independent program but rather a module packed inside a bigger software suite called Leawo Prof.Media. It was integrated into the said suite a few years ago to serve users better as a media processing suite with other modules. Below is the tutorial to guide you through the whole DVD ripping process. If you haven’t done this before, you should be able to do it yourself by following the steps below. Step 1. Enter the target DVD in your DVD drive first to get the disc ready and then double-click the Prof.Media shortcut icon to launch it. Step 2. 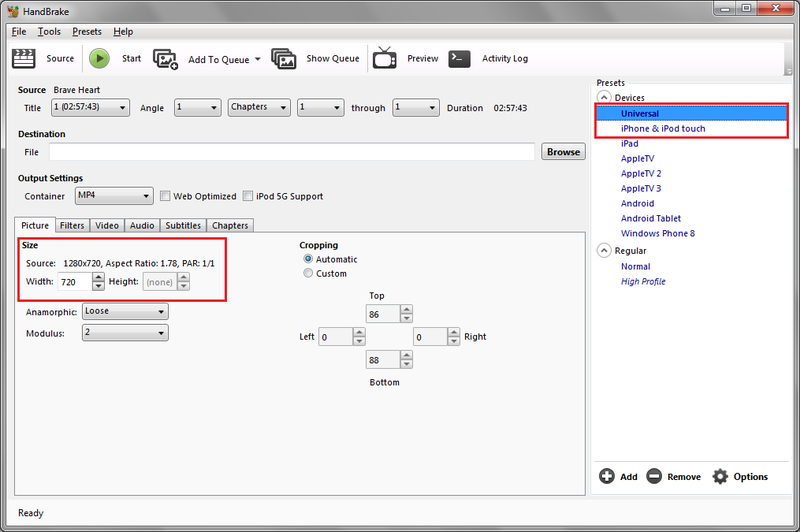 Click the DVD Ripper button from Leawo Prof.Media’s main interface to launch DVD Ripper. Step 3. As the disc’s been put in the drive in advance, it should be ready by now. 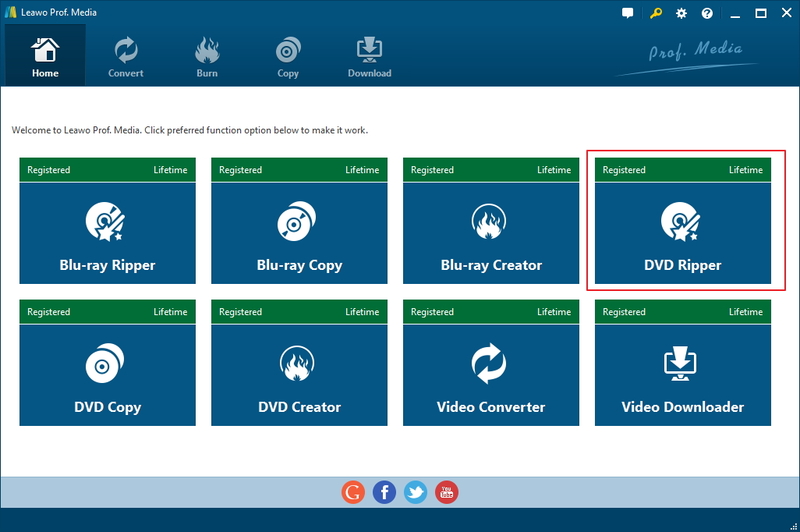 Click the Add Blu-ray/DVD button from the upper-left corner of the interface and then choose Add from CD-Rom from the following menu to see the option for importing data in the disc. Click the DVD title as you see it on the extended menu to have the data in the disc imported to DVD Ripper. Step 4. The program will need you to pick what videos in the disc you want to rip before ripping the disc. It will show you all the video titles in the disc on the following page. And to help you decide which videos to choose, it has a video player on the right side for you to quickly play the videos. Click on the Full Movie button above the video list if you want to rip all the videos to play on iPod Classic. If you only want to watch the main movie on iPod Classic, then choose Main Movie so that only the Main Movie in the disc will be ripped. If it’s neither the main movie nor all the videos that you want, you can click Custom Mode and manually choose videos from the list by yourself. After having the needed videos chosen, there are other settings left. Continue to click OK to have the chosen videos transferred to a new video list. Step 5. When you run Leawo Prof.Media for the first time, it will have MP4 chosen as the default output format. It’s one of the formats supported by the iPod Classic but it might not have the most ideal parameters for playing on the device. So it’s suggested that you choose the profile for iPod Classic for the best viewing experience. Click the MP4 Video button which can be found on the left of the Convert button in green. And continue to click Change to open a new panel. On the following panel, click Device>Apple and find the iPod Classic profile and click on it to set it as the profile for the chosen videos. Step 6. After having the output profile chosen, you are almost ready to get the ripping process started. Continue to click the Convert button in green background to summon a new panel on the interface. All you need to do is set where the output files goes and click the Convert button at the bottom to start converting DVD to iPod Classic. Here’s a brief video tutorial to show you how to rip DVD using Leawo DVD Ripper. If you prefer a free DVD to iPod Classic converter to help you convert DVD to iPod Classic free, there’s actually an option for you. But it involves two programs: MakeMKV and Handbrake. Actually Handbrake itself can rip DVDs to MP4 which can be played on iPod Classic. The reason why it’s not recommended is that you will need to download extra software to enable Handbrake to decrypt DVDs, which could be complicated for people who are not familiar with this kind of thing. The combination of MakeMKV and Handbrake can make the whole DVD to iPod Classic conversion even simpler than using Handbrake alone. But if you are interested, here’s how to rip DVD to MP4 with Handbrake. Here’s why it’s the combination of MakeMKV and Handbrake to rip DVD to iPod Classic. MakeMKV can rip DVDs to a lossless MKV video and Handbrake can help convert the lossless MKV video into a MP4 video playable on the iPod Classic. And both programs are free. Note that MakeMKV can also rip Blu-rays but that part of service is not offered to you free. Have both programs installed on your computer and then follow the instructions below to convert DVD to iPod Classic compatible video with the help of MakeMKV and Handbrake. 1. 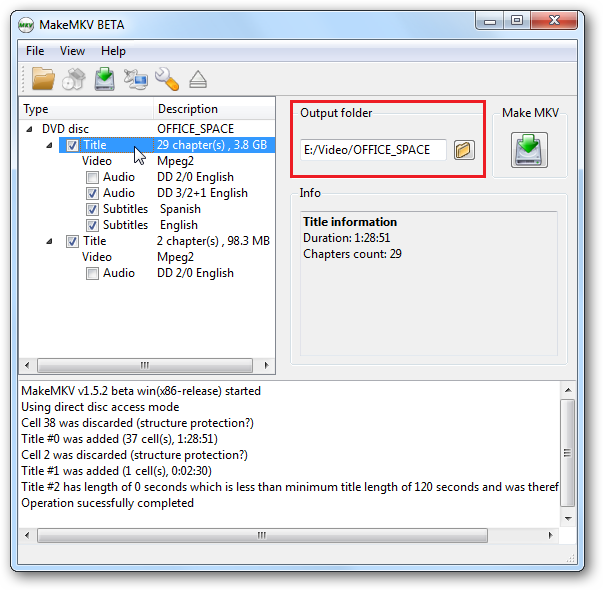 Start MakeMKV on your computer and then put the source DVD disc into your DVD drive. It’s recommended to do it in this order because you would be able to see the DVD drive icon emerging from the interface of MakeMKV. Click on the DVD drive icon and MakeMKV will start to load the data in the source DVD. 2. When the disc is fully loaded, all the data content will be shown on the left side. 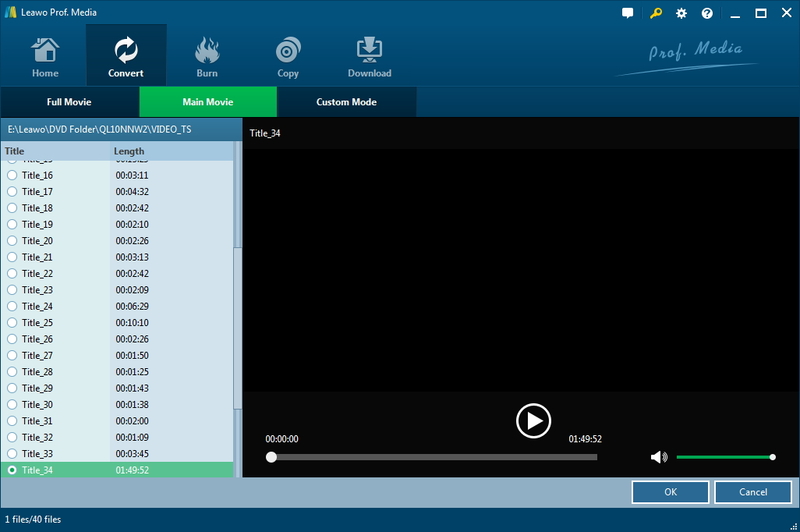 Expand the content list and check the needed content like videos, audio tracks and subtitles. 3. Click on the folder icon under the Output Folder label to set where to save the output video. 4. Click the Make MKV button next to the Output Folder option to start ripping DVD to lossless MKV. After having the DVD ripped and converted to lossless MKV, we’ll be using Handbrake to convert the MKV video to MP4 so that the video can be played on iPod Classic. 1. Open Handbrake on your computer and directly drag the lossless MKV video you just created with MakeMKV to the interface of Handbrake to import the file to Handbrake. 2. Choose a preset profile for the video. You can go with the universal profile and set the resolution and Bitrate in the settings or choose the profile for iPhone. That should be able to work as well. 3. 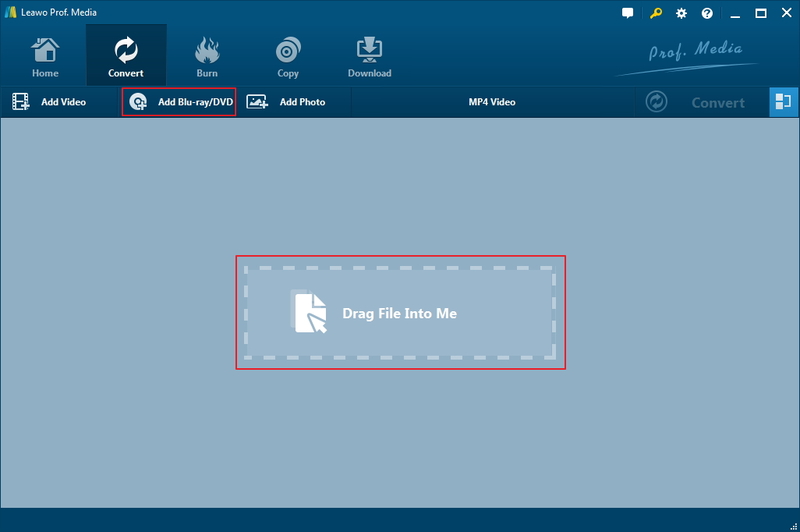 Click on the Browse button to browse for a folder for storing the output video, and then type in a file name for the output video in the File Name box. 4. Click the Start button to start converting the lossless MKV to an MP4 video for playing on the iPod Classic. When Handbrake is done converting the MKV video to MP4, you can start to transfer the video to your iPod Classic for playback. To transfer videos to your iPod Classic more efficiently, I would recommend that you give Leawo iTransfer a try, it’s a data transfer tool developed specifically for data transfer between iOS devices and PC. It can help you easily transfer all your videos and music to your iPod Classic within a few clicks. It’s much more user-friendly than iTunes.